Kevin C. Desouza | Press Release – Assoc. Dean for Research at the College of Public Programs, Arizona State Univ. Press Release – Assoc. 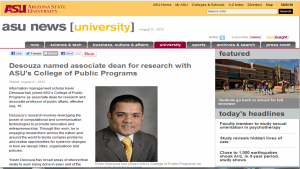 Dean for Research at the College of Public Programs, Arizona State Univ. For the complete announcement, please click here. I am a Sun Devil!